You may have noticed that things are looking a little different around here. 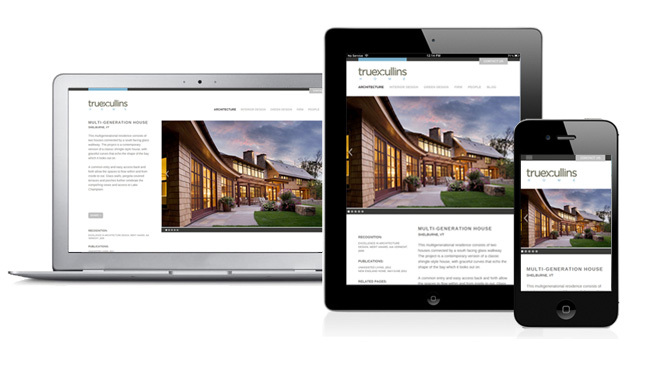 We are very pleased to announce the launch of our new website, www.truexcullins.com. We have retooled our online home from the ground up, with a greater emphasis on project photography, more intuitive navigation, and mobile compatibility. Over a year in the making, the new site was designed and coded by our in-house marketing team. A special thank-you goes to Ben Allred, an architect with TruexCullins and sole proprietor of Pencilgame, a graphic design company in Bristol, Vermont that specializes in logo, print, and web design. Ben led the design and production of the new site, maintaining a clean, modern look while adding functionality to enhance the visitor experience. > Focus on Our Work. First and foremost, our site is a platform to share our work. Pull-down menus have been rearranged for easier navigation. Projects are grouped by discipline and project type, with new categories that include International work, Dining and Furniture Design. A new Green Design page features projects that have achieved LEED Certification and other sustainable design accolades. Index pages make it easy to browse and find specific projects, and project pages feature large photos and project summaries with links to awards, publications and related projects. > Mobile Compatibility. The new site is built on an adaptive framework, which means the site dynamically adjusts to any screen size. More than simply resizing, each page actually reformats itself for optimal viewing on different platforms. The website is now fully compatible with all devices, from smartphones to tablets to widescreen monitors. > A Story to Tell. TruexCullins is approaching half a century of service. While we are always looking forward, we also recognize the importance of remembering our roots. A new History page tells the story of Truex, Cullins, Alexander, DeGroot and all the others who built the firm into what it is today. Our current philosophy and corporate structure is explained in an expanded Overview page. And the firm’s commitment to community engagement is described under Giving Back. > People Power. We know it’s important for you to learn about us as people and potential partners on your project. Larger photos and expanded biographical info now tells you more about who we are. And for the newest addition to the site, we have added professional videos of each of the company Principals. Hear firsthand about our perspective on design and take a walk through some TruexCullins projects. > A Better Blog. Over the past few years our blog has grown into a place where we talk about industry trends, share best practices, and post updates on our current work. The blog has now been redesigned with a clean, consistent look. Articles are searchable by categories, author, and by special series including the Digital Crayon, Making Good Homes, and Innovation at Work. > The Social Network. Every page can now be easily shared on your favorite social networks. Project and People pages can be shared on Facebook, Twitter, Pinterest, and LinkedIn, and our blog is available as an RSS feed. While this new website is a big improvement, it is still no substitute for that personal connection. To learn more about TruexCullins or to discuss a new project, please feel free to contact us by phone or visit our studio in downtown Burlington, Vermont. We always welcome visitors to drop in and see our place of work.